The thermostat is part of the cooling system that regulates the temperature of the system by regulating the flow of coolant in your radiator/engine. It also helps on engine wear and emissions. The valve on the thermostat works with the combination of a cylinder of wax. This helps open and close the thermostat based on the coolant temperature. Thermostats come in a variety of temperature settings according to your engine's optimal operating temperature. The most common reason to change a thermostat is due to it being stuck closed and your car is overheating due to the thermostat is not allowing the flow of coolant from the radiator to the engine. Your temperature gauge will show higher than normal temps within minutes of starting your engine. If this is occurring, do not continue to run your car as you can cause major damage to your motor. Starting with a cool engine, remove the radiator cap. This will help drain the coolant faster. If your engine is hot, wait until it has cooled. Opening up a radiator cap on a hot motor will spew molten hot coolant all over. You've been warned. On the lower driver side of the radiator is the petcock for draining coolant. If you have a stock truck, removing the filer air box may grant you some more room to go from the top. With a pan or bucket in place, open up the petcock and begin to drain the fluid. Note that coolant will start to flow everywhere and not all of it will end up in your catch container. Do the best you can. Clean up any coolant that didn't make it into your catch container. Coolant is toxic to animals, so please don't leave it on the ground. The thermostat on the 4.3 V6 is located on the frontside of the motor on the lower intake manifold inside the thermostat housing. 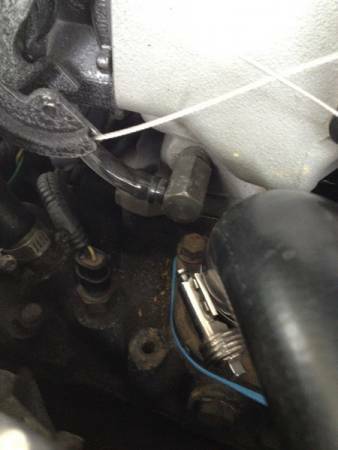 Of course, this is where your radiator hose is hooked up. 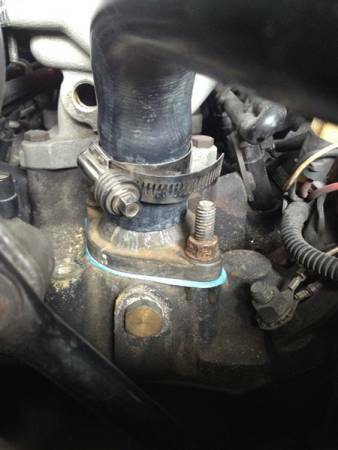 On the radiator hose, there should be some sort of hose clamp. In the picture below, my hose clamp uses an 8mm socket. Yours may differ. Loosen the hose clamp enough to be able to slide it back on the radiator hose to keep it out of the way. Grasp the radiator hose and pull it off the thermostat housing. You may have to twist and squeeze to help the hose loosen up. Once off the housing, bend the hose out of the way. Optional Step: On the front of the upper intake, there is a vacuum line port (Syclone & Typhoon, regular S-Series disregard this step). 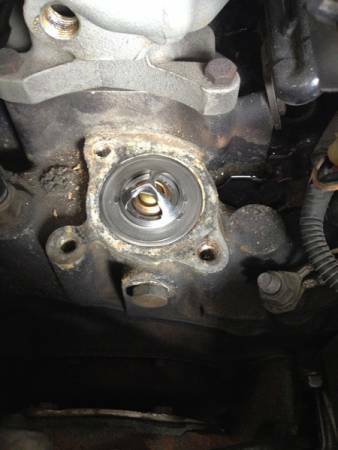 Removing this port will make for easier access to remove the rear thermostat housing bolt. If you choose to remove this vacuum port, it is an 11/16 socket or wrench. I removed mine. There are two 14mm bolts that hold the thermostat housing onto the intake. Remove both bolts. For the rear bolt, an extension with wobble joint makes for easy removal. The front bolt will require a deep socket. If you have having trouble with the back bolt shown in the picture, look back to Step 4. With both bolts removed, you can now remove the thermostat housing. The thermostat should now be exposed. Simply remove it from the lower intake. With the old thermostat removed, you will need to clean up any leftover gasket residue and corrosion around the thermostat/housing area. Using a rag, cover the thermostat opening so that no garbage can fall into the intake. Using a gasket scraper or something similar (I prefer a razor blade), scrap the area clean of any old gasket and crud. A 3M Roloc Bristle or Scotch-Brite Disc works very well too. The goal is to have a clean surface area in order to have a good tight seal. 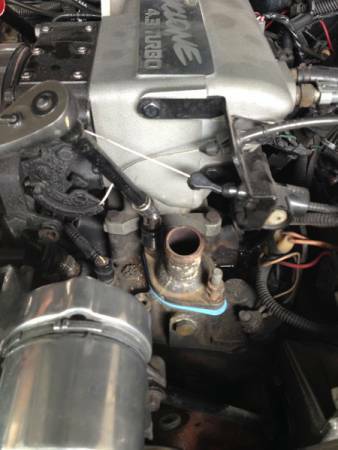 With the area clean, you can now place the new thermostat into the lower intake. 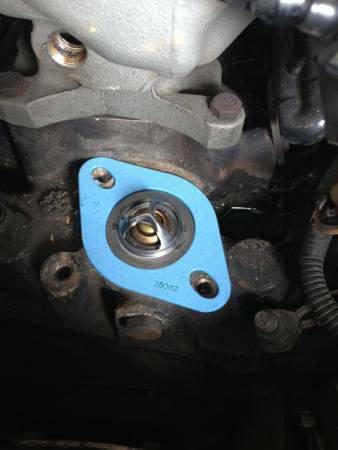 Place new your next thermostat gasket on top of the thermostat making sure you are aligned with the housing bolt holes. DO NOT USE SILICONE WITH THE GASKET! The thermostat housing is ready to go back on, but before you do, check the bottom surface area and remove any old gasket residue and/or corrosion buildup (same as you did on the thermostat surface area). Place the housing on top of the gasket and tighten down the housing bolts. 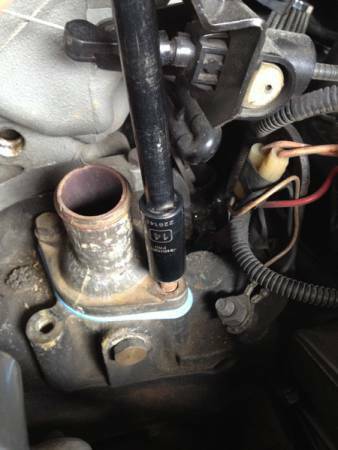 You can now reinstall the radiator hose back onto the mouth of the thermostat housing. Be sure to slide it all the way down the neck of the housing. Retighten the hose clamp. With the radiator hose installed, you must now refill the radiator. Be sure the petcock drain on the radiator is closed. Following the directions on the antifreeze bottle, use only distilled water and fill your radiator back up until it is at the top of the fill neck. The system will have air in it. To help remove air, try gently squeezing the upper radiator hose to "burp" the system. To further help remove air, while the radiator cap is still removed, start the engine and let the engine warm up. Once the engine reaches operator temperature, the thermostat will open and circulate coolant. Slowly add coolant as needed until all air is removed from the system. USE CAUTION AS THE COOLANT WILL BE HOT AT THIS POINT. 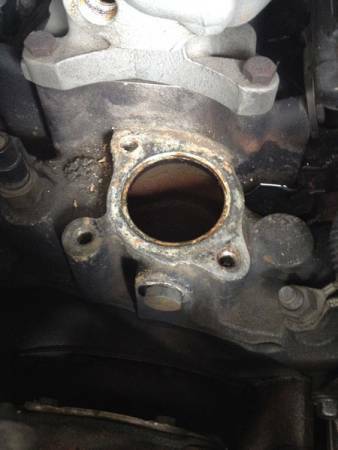 Be sure to check the thermostat housing area for any leaks. Once your coolant level is correct, you can replace the radiator cap. You are done! the bolt hex size is 9/16", not 14mm. while 14mm certainly works, 14mm is a bit larger, and my round off stubborn bolts, where a 9/16" socket may not. If there is any corrosion or pitting on either surface after cleaning, then it may be advisable to utilize a smear of RTV sealant for sealing on both sides of the gasket. Filling the cooling system after service can be frustrating for a novice. It is easy to think it's full, but its not, and th engine overheats severly upon first-start. If you tend to work on items where the cooling system is frequently drained and refilled, drilling a 3/16" hole in the thermostat will allow hassle-free filling of the cooling system by allowing air in the block to vent to the radiator while filling. Another method is to pre-fill the radiator slowly until the coolant level is visible in the upper intake manifold prior to installing the thermostat. After the thermostat is installed, finish filling the cooling system. Trapped air will purge upon thermostat opening.